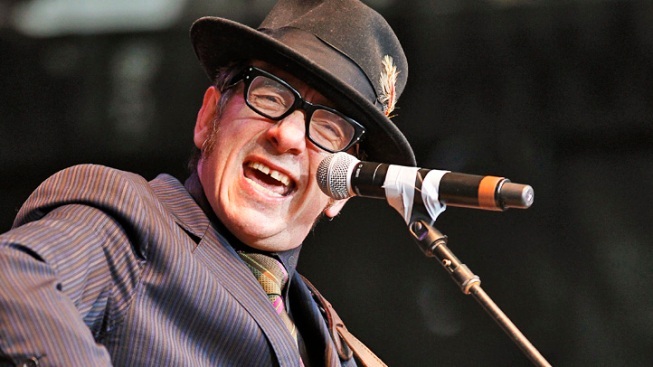 Elvis Costello thinks you're better off buying Louis Armstrong's records. Just in time for the holidays, Elvis Costello has a new $225 box set for sale -- and he's telling fans NOT to buy it. The singer says $225 is just too much to pay for "Return of the Spectacular Spinning Songbook," even if it does come with three CDs, a vinyl record, a concert DVD and a 40-page coffee table book. The music and DVD were recorded earlier this year at a two-night stand in Los Angeles, where Costello spun his game-show-like wheel to select songs that he and his band would play. "Unfortunately, we at www.elviscostello.com find ourselves unable to recommend this lovely item to you as the price appears to be either a misprint or a satire," Costello wrote on his website. Costello tried to get the record company to knock the price down, but was unsuccessful. So he is recommending buying the work of another legendary artist. "If you should really want to buy something special for your loved one at this time of seasonal giving, we can whole-heartedly recommend, 'Ambassador of Jazz' -- a cute little imitation suitcase, covered in travel stickers and embossed with the name 'Satchmo' but more importantly containing TEN re-mastered albums by one of the most beautiful and loving revolutionaries who ever lived – Louis Armstrong," Costello wrote. "The box should be available for under one hundred and fifty American dollars and includes a number of other tricks and treats. Frankly, the music is vastly superior." The London-born, 57-year-old artist, whose real name is Declan MacManus, calls the collection being peddled by Universal Music Enterprises a "hoax," and advises those who really want it to wait until after the holidays and buy pieces of the package separately. For those fans who want to defy Costello and buy it anyway, the whole package comes out Dec. 6, and is actually available on Amazon.com for $202.